After months of anticipation from Android fans around the world, Samsung finally released its Galaxy S10 series smartphones earlier this month. The Galaxy S10e, Galaxy S10, and Galaxy S10+ deliver the bold redesign people have been waiting for, but the S10 series is much more than just a pretty face. The phones are also packed with powerful specs and all sorts of nifty new features, such as in-screen fingerprint sensors on the S10 and S10+. The Galaxy S10 lineup is excellent indeed, but now that it’s here many people are looking forward to what comes next. Samsung has already unveiled two more flagship phones that have yet to be released. The first is the Galaxy S10 5G, a souped up version of the S10+ with a bigger screen, more cameras, and 5G connectivity. Then Samsung will release its much talked-about foldable smartphone, the Galaxy Fold, in late April. Both of those phones are going to be extremely expensive, so many Samsung fans are waiting for the other big flagship launch Samsung is planning for later this year: The Galaxy Note 10. We haven’t seen many leaks so far covering the upcoming Galaxy Note 10. Even still, we have a good idea of what we can expect thanks to patterns that Samsung has stuck to pretty closely over the years. Each year, the Galaxy S phones Samsung releases give us a pretty good idea of what to expect from the Galaxy Note phone that launches later in the year. 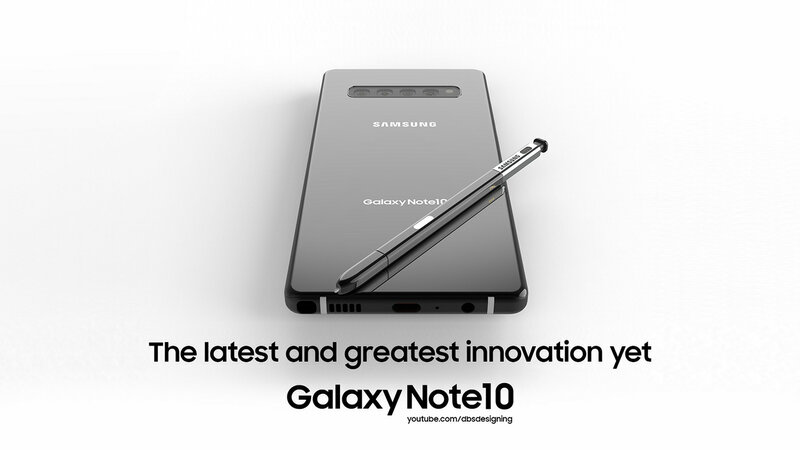 The design might be a bit more square, but the Galaxy Note 10 will probably be a Galaxy S10+ with an S Pen stylus and a few nice new features. With that in mind, we can likely look forward to a Galaxy Note 10 with a Dynamic AMOLED screen that’s a bit larger than the one on the Galaxy S10+, which measures 6.4 inches diagonally. 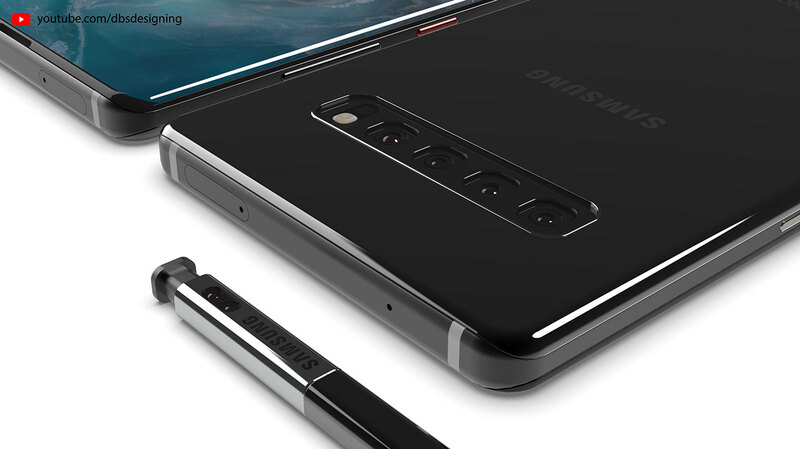 It’ll probably have the triple-lens camera from the Galaxy S10+ on the back, or perhaps the quadruple-lens camera from the Galaxy S10 5G. Around front, we’re likely looking at a hole-punch screen with a dual-lens selfie camera in the corner. Pop-up selfie cameras are a growing trend in China right now, and the OnePlus 7 is expected to finally bring the trend over to the United States later this year. 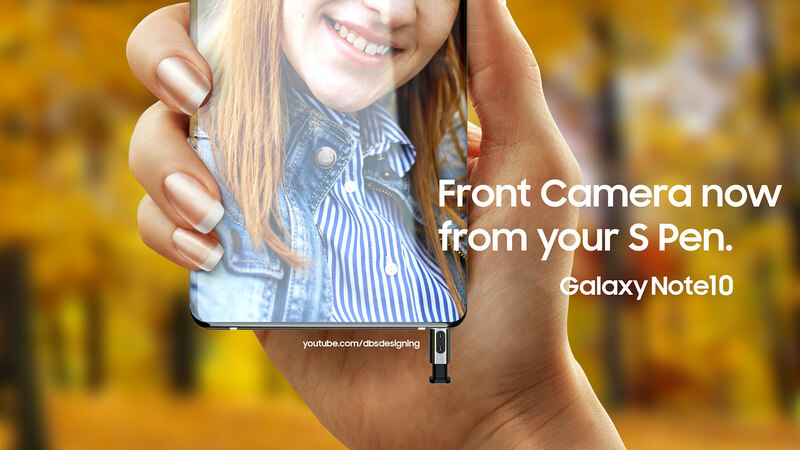 With that in mind, a graphic designer named Muhsin M. Belaal Auckburaully realized a nifty opportunity with the Galaxy Note series and its S Pen stylus, which slides into a cavity on the bottom of the phone when it’s stowed: why not combine the S Pen with a pop-up selfie camera? By removing the camera from inside the display like it is on Samsung’s Galaxy S10 series phones, a true all-screen design could be achieved. The resulting design is purely conceptual. It’s definitely not going to happen — at least, not this year. As of 2018 though, the Galaxy Note 9’s S Pen does have a built-in Bluetooth radio and a battery that charges automatically when the S Pen is stowed, so there’s no technical reason preventing this awesome concept from becoming a reality. 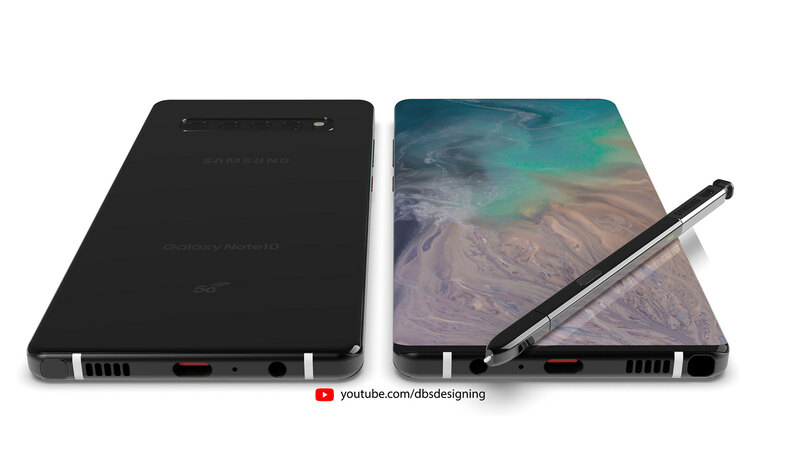 You can check out a few more renders of this very cool Note 10 concept below, followed by a video. The rest can bee seen on Auckburaully’s Behance page.